We are witnessing undoubtedly the biggest political crisis to strike Serbia since the September of 2000 and perhaps even since the winter of 1996-97. The biggest news in Serbian mainstream media, especially on TV, is that there is no news, at least not any real ones. The ones that we get served with are either detached from the truth or significantly toned down. Instead of covering the recently held parliamentary elections, that were controversial to say the least, Serbian national TV station, the RTS, chose to interview a couple of municipality leaders from smaller towns in Serbia on communal issues. That scene has somehow reminded me of the broadcast that RTS made on October the 5th 2000, when hundreds of thousands of people gathering in a rally to overthrow Milosevic were shadowed by nature themed programs and a movie marathon. As time passes it becomes clearer and clearer that the Serbian parliamentary election of 24. of April 2016 was largely irregular, and given the fact that the legal deadline for the National electoral committee to declare the official results has already passed, it can be assumed that the only solution to the crisis that is developing is to repeat the entire election process. The night after the election, it was made clear that SNS (Serbian Progressive Party) had, despite the support it received from the main autonomous monitoring body, CESID (which did the same thing during the Montenegro independence referendum of 2006, with the support of EUs Frantishek Lipka and Miroslav Lajcak), failed to pull of an election fraud. Vucic was supposed to admit the fact that his bluff had failed and acknowledge the true results. Instead of that, a true game of nerves had developed. The first party to publicly proclaim that the election was rigger was the social-democratic DS (Democratic party), followed closely by Sasa Radulovic, an independent candidate, and Dveri-DSS coalition led by Bosko Obradovic and Sanda Raskovic Ivic. When the coalition around the former Serbian president Boris Tadic filed its complaints, the snowball had already turned into an avalanche. Instead of a scenario in which everything would remain on the level of a short term scandal, and a parliament with a strong opposition, the one that would frighten the SNS, would be formed, the electoral theft developed in proportions, especially concerning the vote of Serbs from Kosovo, leaving the room for unpredictable consequences. SNS may still have some space to maneuver with in order to prevent mass protests that will be organized by the opposition. However, it seems more likely that they will get consumed by sheer thirst for power that will eventually, following a Serbian proverb, lead them to lose everything. The nature of power is such that it expands without limits, until in gets into contact with an even bigger power. On the global scale, this law is best shown in a recent example, when the United States were, with great difficulties, made to understand that they cannot bomb Syria in 2013 the same way that they previously attacked Republika Srpska, Srbija, Afganistan and Iraq... This law, however, still remains to be understood among the circles of the current Serbian government lead by Aleksandar Vucic. 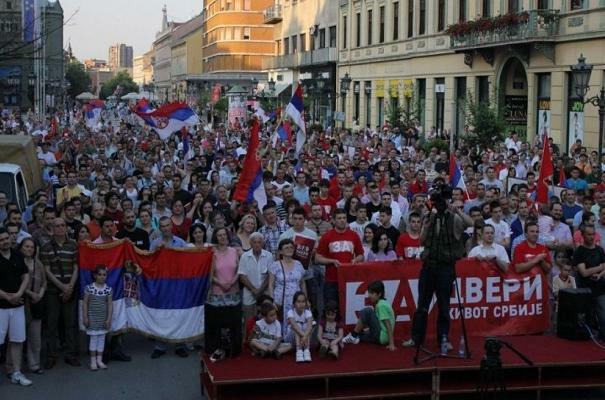 The will of the Serbian people has been stepped on and that can only provoke rage and discontent among a population already devastated by poor economic conditions and humiliation on an international and foreign policy level. The roll of the West in all of this is especially shameful, as it once against proved to be indifferent towards the issue of democracy in Serbia, as long as the country follows the geopolitical directives received from abroad. The representatives of the political West, that are probably aware of the true election results, were in a hurry to congratulate Vucic on his victory and on the democratic standards to which the elections were supposedly held. The same goes for the western mass media. This charade in Bantustan, as Serbia is viewed through the racist lens of the West, was joined by the OSCE mission, who failed to comment, even by denying, the fact that one of their monitors from Ireland was beaten in Kosovska Mitrovica by a criminal gang connected with the SNS, just because he pointed out some of the many irregularities of the electoral process. Let us be reminded that OSCE had sent the former prime minister of Spain, Felipe Gonzales, to Slobodan Milosevic's aid in 1996. His mission was the main factor that lead to the protests ending, givin the regime a special law (Lex specialis) and acknowledging the stolen election that kept Milosevic in power for three more years. That way, the West, led by the US, was granted the opportunity to bomb Serbia and take Kosovo and Metohija from it. Attacking a country with a pro-Western government would leave a bitter taste, so the global media machinery had to satanize Milosevic, turning him from a "factor of peace and stability in the Balkans" that he was represented as in 1995, to the "butcher of the Balkans" in the late 1990s. Even the colorful hippy neo-trotskyist party of his spouse (with the help of Pink TV, that would turn out to be the dowry for every future government of Serbia) that destroyed Milosevics Socialist Party from within, as a cancer, could not change that picture. The same thing that they did with Milosevic, the Western media can do with Vucic. He can easily be turned into a "bloody chetnik" with memories of his role in the last government of Milosevic (where he served as the infamous Minister of information) being reawaken. The true question is why the West has kept him in power thus far. In order to change the constitution of Serbia and let Kosovo join the UN the same way it was allowed to join the International Olympic Committee? How strong the analogy between Vucic today and Milosevic in the second half of 1990s truly is? Having in mind the way in which the last conference of RIK (National electoral comittee), held on Great Friday, has transpired, it is clear that the DSS-Dveri coalition if the biggest thorn in the eyes of Vucic and his western overlords. The artificial degradation of their vote to a single ballot below the 5% threshold can only deepen the crisis that is developing. The idea of Vucics regime is to "satisfy" the pro-western opposition by "letting them" pass the threshold and gain seats in the parliament, abandoning the complaints that they earlier made together with DSS-Dveri and letting the nationalist coalition down the drain. It is hard to give a good forecast if this will happen or not, but I would bet against it. The crisis, on the other hand, is certainly going to deepen. The opposition is simply enganged in a struggle too long and hard for achieving a fair treatment in the media and in the electoral process itself, to abandon the fight at this point, especially in the light of so many irregularities concerning the voting and counting of the votes. The attitude of the SNS government has served to homogenize the opposition, not in an ideological manner, but purely in its struggle for fair political treatment. And last, if they fail to stand behind DSS and Dveri, the other opposition parties will suffer the same faith that Seselj did, exposing himself as an agent of Vucic. The president of the National statistic bureau, Miladin Kovacevic, openly threatened Dveri leader Bosko Obradovic, telling him that his refusal to acknowledge the election results will be "sanctioned". The next step for the SNS is to enforce direct state sponsored repression, aided by the West, similar in a way to South American military juntas of the 70s and 80s or the Greek junta that all had western geopolitical support. However, this scenario will not transpire without a heavy resistance of the opposition, first through institutional methods and then through mass protest similar to those held in 1996-97.